What’s better than puff pastry and sugar?! 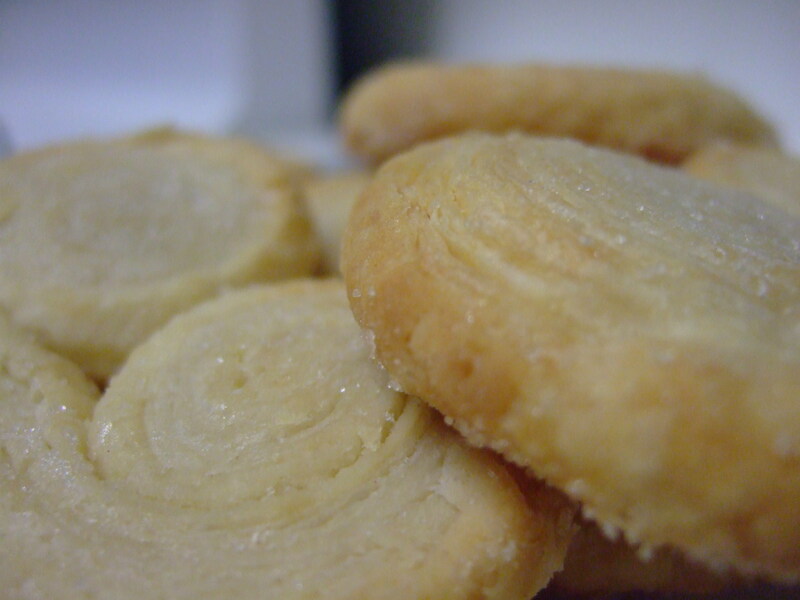 Palmiers, also known as Elephant Ears, are a cookie type dessert made of puff pastry. We made these using the left over pastry that was not used for our apple turnovers (which I will post next). Roll your puff pastry to a 14″x8″ rectangle (it’s okay if your measurements are slightly different, just as long as you have a rectangle). Starting with a wide end, roll evenly towards the center three times, about 3/4 inch each roll. Repeat on the other side, until it reaches the center and your other rolled half. You should have a long, narrow, log. At this point, you can refrigerate the log to firm it up, or you can continue if it’s hard enough. Starting on the narrow end of the log, cut 1/2 inch disks and place onto parchment paper. After the disks have been cut, cover each palmier with granulated sugar and then flip over to coat the other side. Using the heal of your hand, press down each palmier slightly. Bake at 350 degrees for about 12 minutes. Midway through baking, take out your tray and flip over each palmier.